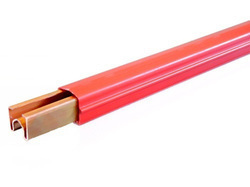 Ambition is the leading manufacturer & exporter of Crane Shrouded DSL Busbar system. Shrouded Bus Bar (DSL) system are used for the electrification of mobile equipment. The shrouded bus bar is a safe, economical and low maintenance way to solve mobile electrification requirement. Systems can be designed to accommodate 60 to 1200 amperes. Depending on the application there are various options and accessories that can be custom engineered for your conductor bar system. Portions of the system can be pre-assembled at the factory to help ease installation. Conductor bar can be found on overhead crane runways, hoists, trolleys, conveyors, port crane and people movers. Cover with ultraviolet additive for outdoor sun locations High temperature cover (280F) for all conductors Stainless steel conductors in for corrosive atmospheres Epoxy coated, stainless steel, and insulated hangers for wet an corrosive atmospheres Factory built expansion sections and anchors for expansion control Factory bent curved conductor sections systems A variety of covers for matching competitive systems Heated conductor systems for ice prevention on outdoor systems or freezer storage Totally enclosed covers with flap for air-born contaminants, indoor & outdoor versions Bare conductors available for extreme heat applications Special long-wear collector brushes for systems. Crane manufacturers, Heavy industries, Steel industries, Metal industries, Indian Railways, Public sector undertaking, Automobile industries, Power plants, Docks & ports Exports. 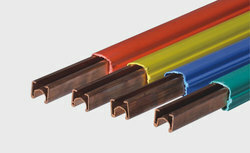 Shrouded Bus Bar (DSL) system are used for the electrification of mobile equipment. The shrouded bus bar is a safe, economical and low maintenance way to solve mobile electrification requirement. Systems can be designed to accommodate 60 to 1200 amperes. 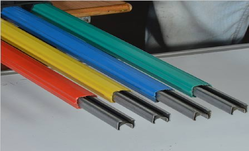 Depending on the application there are various options and accessories that can be custom engineered for your conductor bar system. Portions of the system can be pre-assembled at the factory to help ease installation. Conductor bar can be found on overhead crane runways, hoists, trolleys, conveyors, port crane and people movers. Cover with ultraviolet additive for outdoor sun locations High temperature cover (280F) for all conductors Stainless steel conductors in for corrosive atmospheres Epoxy coated, stainless steel, and insulated hangers for wet an corrosive atmospheres Factory built expansion sections and anchors for expansion control Factory bent curved conductor sections systems A variety of covers for matching competitive systems Heated conductor systems for ice prevention on outdoor systems or freezer storage Totally enclosed covers with flap for air-born contaminants, indoor & outdoor versions Bare conductors available for extreme heat applications Special long-wear collector brushes for systems. 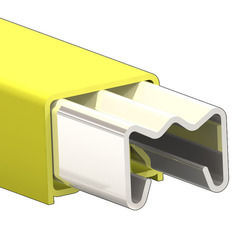 Ambition Tech Hub is the Manufacturer of Heavy Conductor Bus bar system. 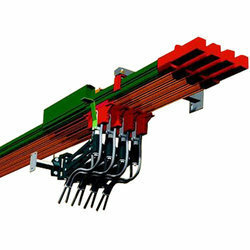 Heavy Conductor Bus bar system is used for the electrification of mobile equipment. The shrouded Bus bar is a safe, economical and low maintenance way to solve mobile electrification requirement. Systems can be designed to accommodate 60 to 1200 amperes. Depending on the application there are various options and accessories that can be custom engineered for your conductor bar system. Portions of the system can be pre-assembled at the factory to help ease installation. Conductor bar can be found on overhead crane runways, hoists, trolleys, conveyors, port cranes and people movers. DSL Conductor bar track is super finished and the cross section is maintained to achieve required ampere. The material for the track is G.I & copper. Conductors shall be accurately aligned to ensure positive electrical contact between the collector and the conductor. Separate conductors shall be provided for each phase. Insulation cover shall be rigid PVC. GI Current Capacity 60 A to 125A. Aluminium Current Capacity 125A to 500A. Copper jointless 25A to 200A. 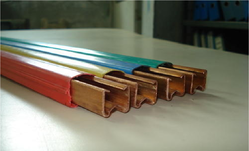 Copper Current Capacity 60A to 1200A. 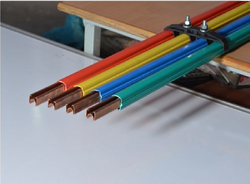 Pin joint Shrouded Bus bar system is used for the electrification of mobile equipment. The shrouded Bus bar is a safe, economical and low maintenance way to solve mobile electrification requirement. Systems can be designed to accommodate 60 to 315 amperes. 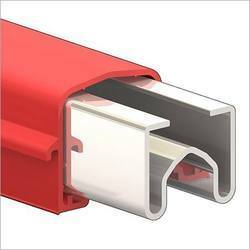 Depending on the application there are various options and accessories that can be custom engineered for your conductor bar system. Portions of the system can be pre-assembled at the factory to help ease installation. Current Flow 200 Amp to 350 Amp. 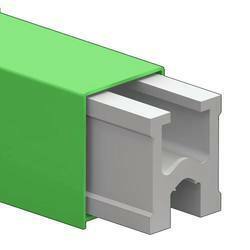 DSL Conductor bar - the track is super finished and the cross section is maintained to achieve required ampere. The material for the track is Aluminum. Conductors shall be accurately aligned to ensure positive electrical contact between the collector and the conductor. Separate conductors shall be provided for each phase. Insulation cover shall be rigid PVC. The range of Ampere available with the material of Aluminium.